Where are the shops and restaurants? Marsha moved to her dream home last year. She loved the neighborhood, she loved the schools, she loved that it was close to her work. She thought that she loved everything about it. The one thing she didn’t consider before she moved was where the nearest shops and restaurants were. Before she moved, she didn’t realize that she’d have to drive almost 20 minutes to pick up eggs and milk at the grocery store. Dropping a package off at the post office took 22 minutes each way. And, strangely, there wasn’t a coffee place anywhere in sight. If you are planning on moving, you’ll want to know where the closest shops and restaurants are to your future new home. One way to do that is to drive around before you buy the home. Driving around would be a good way to find the nearest shops and restaurants to a home. Or, you could “let your fingers do the walking” and start here. You could also start by finding shops and restaurants here, at Home by School, on our Home Search App*. By looking first at the general layout on the map, you will save yourself from doing lots of driving. Our Home Search App* can help you select a home that is as close to the amenities as you would like it to be. 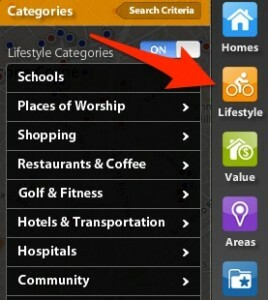 Finding shops and restaurants is as simple as clicking on the orange Lifestyle button on the right-side of the map. A menu will slide out and you can turn on the different categories that you’d like to see displayed on the map. 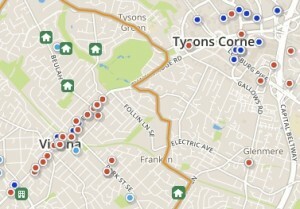 On the map above, you can see Tysons Corner, as well as the town of Vienna, VA. The red dots are food shops. The dark blue dots represent coffee houses. You can also turn on dots for places of worship, fitness centers, hospitals, and much more. But let’s say that you have a strong affinity to a certain coffee house, how do you sort through all the dark blue dots? Or, you can show only certain Mexican restaurants, for example. As you see, the Home Search App* doesn’t just show you homes for sale and schools, it also shows shops, restaurants, hospitals, coffee places, and much, much more. Marsha didn’t realize until too late that the grocery store was too far away for her liking from her new home. But you don’t have to find out too late if the home you like is close enough to any amenities. Use the Home by School Home Search App* and you’ll be able to find your dream home as close to the amenities as you’d like it to be. To find out where the nearest shopping, restaurants, (and even the dry-cleaners), are near each home for sale, check out our Home Search App*. Once in the App, you can turn on features to show you all that is around a property. Start your journey by logging in, then selecting a school boundary from the Fairfax County Map. 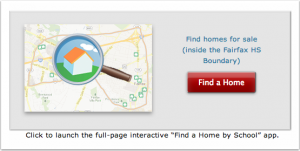 Once on the boundary page, click on the red button to access the Home Search App*. 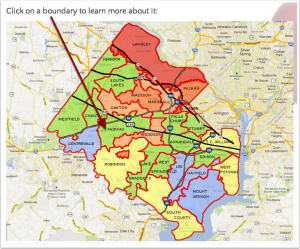 Start your journey by selecting a school boundary from the Fairfax County Map (be sure to log in first). * The Home Search App currently works on desktop devices and some non-iOS mobile devices (unless you have a Flash-compatible iOS browser such as Puffin or Photon).